At last! We have found a Wool Comforter that is washable. 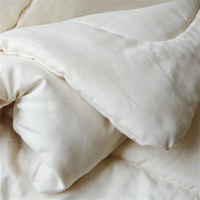 Pure, natural, virgin wool covered in tightly woven organic cotton sateen. Wash on cold. Air fluff (no heat) or line dry.